I wrote about the ethics of mammoth cloning for the Guardian’s Comment is Free pages. You can read what I think here. A quick update: Although in this interview with the Naked Scientists, George Church directly discusses elephant surrogates, I’ve just heard on the grapevine that he now intends to only use artificial wombs. I’ve emailed him to find out if this is true. Will update as soon as he answers. In the mean time, I’ve asked the editors to add in a ‘probably’ to add some necessary ambiguity over the use of Asian elephant surrogates. I’m not sure how I feel about this. Would I want to see a cold-adapted Asian elephant in Siberia if no animals were involved in the experimentation? It raises a different set of ethical questions, and I’m still thinking about it. But one thing it doesn’t change is my scepticism over this plan of action as a feasible tool to mitigate climate change. Artificial womb technology seems a long way off, extending the timescale over which we can expect to see a viable cold-adapted Asian elephant in the world. Even *if* the reintroduction of cold-adapted Asian elephants could do what its proponents hope — and we don’t know that it will — the time taken to genetically engineer, and artificially gestate elephants in the numbers that would be required is going to be considerable. And I doubt we have that kind of time when it comes to climate change. I’d like to see some well-thought out data and modelling on this, rather than romantic daydreams. “The answer to your question is: Yes. Someone may use a surrogate elephant mother, if the chances of success are high and the expected benefits for the species survival/diversity are high (for example, due to extended geographical range). My group will be working hard on alternatives, but it would be premature to guess at the exact state of rapidly progressing reproductive technologies years in the future. “Getting full mammalian development to work in vitro is important for may reasons (testing hypotheses, testing drugs, tissue, transplantation, developmental biology, etc.) Most vertebrates develop outside of a parental body. For mammals, there are at least two options: 1) running blood directly through an umbilicus or 2) running blood through a placental interface. We just published some relevant new technologies: 1) CRISPR activators which allow epigenetic reprogramming and 2) in situ sequencing which allows analysis such reprogramming for closeness of fit to natural equivalents, 3) CellNet software to decide on multiple regulatory adjustments. Automation allows us to optimize numerous parameters simultaneously. It is hard to estimate how long this will take, but we have been pleasantly surprised few times recently, with technology arriving far sooner and better than expected (e.g. next-gen sequencing and CRISPR). “You and I seem well aligned on this [GC is referring to my op-ed CiF piece]. I would certainly prefer to not interfere with Asian elephant healthcare, except positively. My lab’s success already in using CRISPR on Loxodonta fibroblasts has not hurt elephants and hopefully will help in understanding their biology. The costs and quality are improving rapidly since the protocols are being debugged in the context of experiments focused on human and mouse. We are exploring methods to go from mammalian stems cells to embryos to babies, with inexpensive automated processes and high efficiency. If this works for mouse and pigs, then similar endeavors could be made for elephants. This should help (rather than hurt) reproductive efforts for these precious species. If we are successful in making cold-resistant versions of Asian elephants, then that might further help conservation efforts by allowing them to occupy locations with very low human population density and abundant vegetation. Mammoths: Ice Age Giants! is over and baby mammoth Lyuba is returning home to the Shemenovsky Institute in the Yamal-Nenets region of Siberia. Lyuba is an almost perfectly preserved mammoth baby who, despite being healthy and well-cared for (the milk remains in her stomach show she had recently suckled from her mother), met an untimely end when she fell into a quick sand-like bog or pool. That same fate however led to her being so well-preserved, frozen in the permafrost for 42,000 years. Having been thoroughly scanned, sampled and autopsied in the name of Science, Lyuba was preserved in the same way as Lenin so that she could go on public display. The Natural History Museum was the first time she had gone on display in Western Europe. You can see me telling CBBC’s Newsround about Lyuba & the Exhibition here. I wasn’t there when she arrived at the NHM (I was doing publicity for the exhibition on Start the Week instead – see this post), so I missed the emotional unwrapping of Lyuba by Adrian Lister. And even though it was still pretty special to see her even through a glass case, I was frankly rather jealous. I wanted to smell her, and look at her eyelashes, and get a really close look at her exquisite trunk. So I wangled an invite to her ‘de-install’ on September 8th. Or as I prefer to think of it, the official tucking-up of Lyuba for her journey home. And she was indeed beautiful, lying in her travelling case amidst layers of protective padding, her eyes closed as if she really was asleep. I can tell you that she didn’t smell at all. Perhaps the faintest hint of Siberian tundra in the summertime, but I may have imagined that. Start the Week: Alien Invaders! While baby mammoth Lyuba was being unwrapped at the Natural History Museum by my boss Adrian Lister, I was at Broadcasting House for Start the Week, to discuss the thorny subject of Alien Invaders. Not the out of space kind but the movement of animals across the globe, and the emotional subject of the value of native vs non-native species. On the programme with me were: Ken Thompson, whose new book Where do Camels Belong? addresses these issues head-on; Monique Simmons from Kew, an organisation tasked with minimising the UK’s risk from invasive plant species; and John Lewis-Stempel, whose new book The Private Life of an English Field mourns the loss of traditional farming methods — and a number of well-loved, if non-native species alongside. I gave a palaeontological perspective to the discussion. Plus a preview of Mammoths: Ice Age Giants! and some bonus dwarf mammoths. I never really felt the discussion really took off – but it was fun nonetheless. In particular I felt that Ken (on the program and in his book) was a little bit naughty in shifting effortlessly between the idea of ‘non-native’ species and ‘invasive’ species. I agree that the idea of a ‘native’ British fauna is highly problematic, but it isn’t really fair to paint conservationists as idealogical zealots here: the species they most worry about are the invasive ones. The ones that swamp out all others, reducing local biodiversity and often causing other species to go extinct. And yes, while species distributions change through time making the idea of a natural baseline highly era-specific, once you accept that maybe ‘natural’ isn’t the be-all and end all it is time for a more challenging discussion: what is it that we value about our environment and the species around us? What kind of world do we want to leave behind? There aren’t any easy answers to that, but I suspect the answer isn’t throwing up our hands and doing nothing at all. Ken’s book is really a long-form version of this paper by Mark Davis et al [££] from 2011, which he was a co-author on. It generated quite a number of responses from ecologists at the time: see this letter by Dan Simberloff [co-signed by 141 other scientists; ££]. If you have access to Nature, they are both well worth a read, as are the references they cite! Rodents of Unusual Size? I don’t believe they exist*… At least, not in the way that some media outlets would have you think. Last week journalists reported A LOT on the possibility of giant sheep-sized rats evolving in the future. See here, here and depressingly** also here. I was asked for comment by the BBC a couple of of times — the first time I refused as I was busy (I had 30 mins notice and at that point I had no idea what the story was about). Plus, it sounded like a tabloidy link-bait story where I would find it hard to get a complicated point across if the angle had already been established as ZOMG EVIL KILLER GIANT RATS OF THE FUTURE. However, afterwards the guilt got to me. Surely this is *exactly* when I should be joining in the discussion & trying to improve the quality of coverage? So when the next request came through I decided to make the time for the journalist’s questions. They were hard to answer in a way which satisfied me, as they felt like they were pushing me to provide quotes that would still miss what I felt was the fundamental point of the R.O.U.S. story: the impact of the Anthropocene, especially on biodiversity. As Henry Nicholls blogged (thank you Henry! ): the mass extinction crisis we are facing in the Anthropocene is no laughing matter. As I have no idea if any of what I wrote will even be used, The BBC used some of my replies in this article. I thought I’d pop up my full reply here (typos included) so this effort actually goes *somewhere*. It’s one of the many examples of the ‘hidden service’ that researchers do for free all the time. 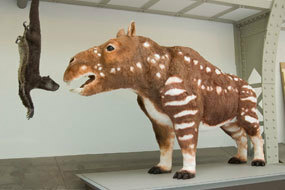 An imagined giant rodent of the future, from the Gallery of Evolution at the Royal Belgium Institute of Natural Sciences. Copyright RBINS. Thanks to Mark Carnall of the Grant Museum for bringing this to my attention. * This, by the way, is a Princess Bride quote. Rodents of unusual size do indeed exist, and even larger ones have existed. Evolution is amazing like that. The museum press office passed on your questions to me. To give you some background to my expetise, my research investigates the evolution of dwarf elephants (now extinct) that used live on islands like Sicily, Malta, Cyprus and Crete (e.g. see here). Interestingly, on islands while large mammals such as elephants and hippos evolve to become smaller (1m-tall adult elephants! ), small mammals like rodents evolve to become bigger. But no island rat has approached anywhere near the size of a sheep. The sort of evolution scenarios that Dr Zalasiewicz is speculating about would occur over huge swathes of time – tens of millions of years. Those sorts of timescales would allow for a myriad of wondrous forms to evolve: just look at the enormous diversity of the mammals that have evolved in the last 65 million years. I only have the University of Leicester press release to go on, but it seems to me that Dr Zalasiewicz has set up an interesting thought experiment, but one that is quite specific in its scenario and doesn’t lend itself to the broader Qs you have asked. Hence my answers wont fit perfectly with your questions I’m afraid. Q8: Is there anything else he/she would like to add on the subject? It’s really fun to speculate about what the distant future might hold for the evolution of life on earth – the possibilities are endless. But we know from the fossil record that it takes, on average, ten MILLION years for life on Earth to bounce back from a mass extinction event. So while it is fun to think about the wondrous new forms that might arise, it is far more chilling to think of the species we are losing right now, and how long it will take to replace them. Certainly, given the average duration of a species, no human would get to see this imagined future ecosystem. Q1: If certain animals went extinct because of climate change, would the evolutionary principle of niche-filling really extend to just one taxon? Only if all species bar one went extinct. Any species surviving an extinction event may eventually evolve to fill empty ecological niches. So the question is really “Which species are currently the most vulnerable to extinction” (because we’re set to lose those) and “which species are not at risk at all” (because that what will be left for natural selection to work on, the ancestral species of the future). Q3: Would rats really be the ideal candidates for the taxa that would fill any ecological gaps? Certain rat species, like the brown rat Rattus norvegicus, have a large, globally distributed population, and so are very far from extinction right now. The brown rat is also a generalist, flexible in its diet and ability to live in different environments – factors key to its success as an invasive species across the world. Q4: or is their current niche too much of a success for them to need to adapt? The crux of this question is time: in the very short-term, as we are seeing with invasive rat species today, rats are able to spread into unoccupied niches because they are generalists. Once in a new niche, natural selection continues to act – hence on islands, rats tend to evolve to be come a little bit larger. This might occur over hundreds to thousands of years. But when you zoom out to 100 million years in the future, we aren’t just talking about evolutionary changes in the rat – but the whole environment, throwing up new challenges the whole time. Continental drift; new mountain ranges; significant changes in climate; unpredictable catastrophic events like a meteor hit. And set against all this a continuous, complex evolutionary interplay between individuals competing for space to live, eat and breed. This is what Dr Zalasiewicz is talking about – but when you get to this stage, it makes no sense to call that theoretical sheep-sized animal of the future a ‘rat’ at all. It may have had a rat as an ancestor, but it will be something totally new, in a different ecological niche. Q5: As global warming continues would an increase in global temperatures (and CO2) due to climate change result in animals getting bigger? Q6: or would animals actually be likely to get smaller? It’s impossible to generalise in such a way: What animals? Where? Over what timescales? The size of an animal affects everything about it – where it can live, how it moves, what it can eat, how many offspring it can have, and how fast it can have them. This means that the size of an animal is a trade-off between all these things, and will evolve to best fit the ecological niche available to it. Q7: Apart from the famous KT extinction, are there other examples of certain species/ groups filling an ecological niche after an extinction event? Many. For example, the biggest mass-extinction event – the Permo-Triassic extinction, or the “Great Dying”, approx 250 million years ago – killed up to 97% of all life on Earth. It took up to 20 million years for life to recover in terms of species number and diversity – on land, some of the groups that were very successful were the Archosaurs, a group which includes the dinosaurs (including birds!) and crocodiles. The dinosaurs would go on to to diversify into a wide range of ecolgical niches. I’m part of an EU-funded project to 3D-print the skeleton of a dwarf elephant skeleton from Tilos, and one of my jobs has been to CT scan the skeleton of an Asian elephant. This is so that colleagues Evangelos and George Theodorou in Athens can use these scans to fill in any gaps they have in the dwarf elephant skeleton (for example if certain bones are missing from the fossil collections). …before heading back to the NHM with our elephant all wrapped up. My mum came to work with me that day. Hugh Falconer was the first person to describe a dwarf elephant (150 years ago, in 1862). He was pretty terrible at publishing however, and this is making my work on sorting out the messy state of Sicilian and Maltese dwarf elephant taxonomy rather tricky. After his death, his friends turned his notes and letters into a book as a way to make up for his lack of lifetime publication. It ran to two thick volumes! There must have been a huge pile of papers and notebooks – but the originals seems to be lost. I went to the Falconer Museum in Forres to see if anything was hiding in the archives. Forres, by the way, is better known for its association with Shakespeare’s Macbeth: Duncan’s castle was in Forres, and the three witches toiled and troubled thereabouts. Judging by the witches stone on my walk to the museum, they’d have met a sorry end had the locals got hold of them. Witches Stone, Forres. 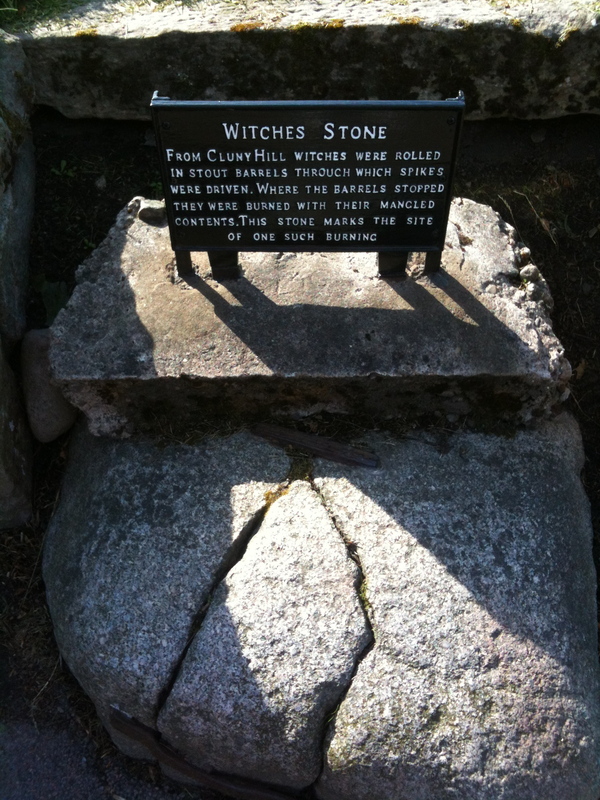 Inscription reads: ‘From Cluny Hill witches were rolled in stout barrels through which spikes were driven. Where the barrel stopped they were burned with their mangled contents. This stone marks the spot of one such burning.’ Nice. If anyone has any thoughts as to the whereabouts of Hugh’s notes, do let me know. 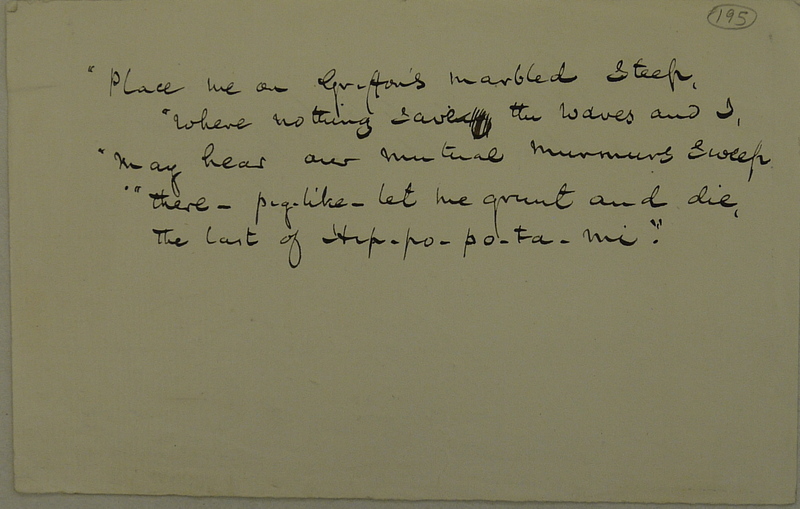 I’ve checked with the archives of George Busk (his great friend) and Charles Murchison (who edited the Memoirs and Notes of HF), and looked in the NHM archives. I’ve also asked at Edinburgh and Aberdeen university, and the Linnean Society. 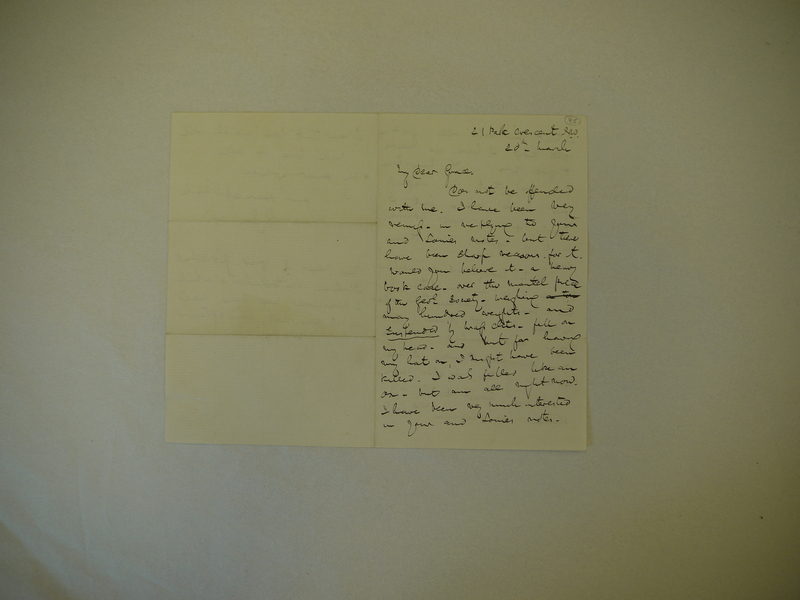 Some letters survive in the Darwin archive (they are very poignant… poor Hugh seems to have waited in rather wistfully for Charles D to visit, only to be continually disappointed), but otherwise I’m at a dead-end. 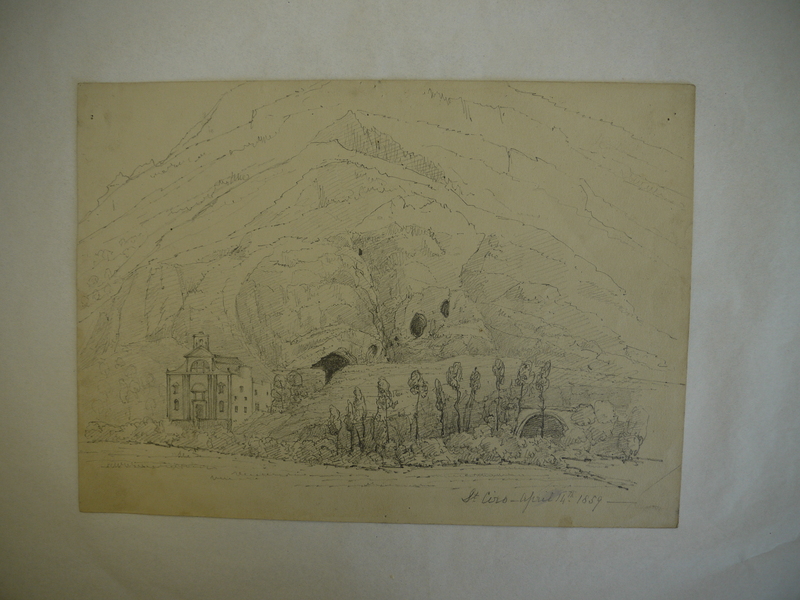 Anyway – a few treats from Hugh Falconer’s archive, courtesy of the Falconer Museum in Forres (which you should visit if ever you’re in Scotland). All photos are (c) Forres Museum. HF survives an incident at the Geological Society, thanks to his hat. Letter to his niece Grace. HF identifies with a hippopotamus. San Ciro Cave, in Sicily. 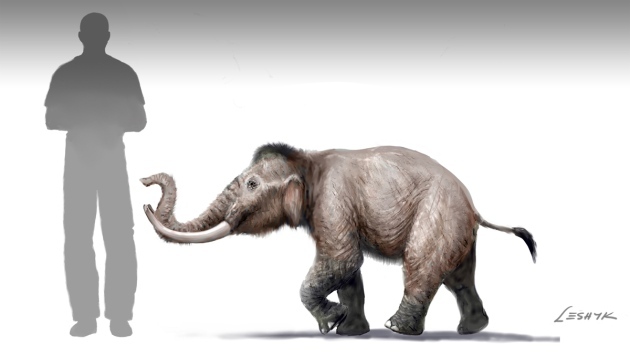 My Royal Society Proceedings B paper Extreme insular dwarfism evolved in a mammoth is out. The NHM’s film-maker Sally Weale made a really nice short film about it. Lovely excerpts from Dorothea Bate’s diary that really capture the thrill of discovery. More here on the NHM website. And you can download the paper (for free!) from the Royal Society here. And I also went on CBC’s Quirks and Quarks to talk about the paper. You can listen to the show here.